Nov 01, 2009 in "Epcot International Flower and Garden Festival"
LAKE BUENA VISTA, Fla. – The 17th annual Epcot International Flower & Garden Festival kicks off March 3 – earlier than ever – and continues for 75 days through May 16, 2010, with bold strokes of seasonal color and brand-new topiary whimsy. Last year’s festival began March 18; now Walt Disney World guests get a head start on the gardening season as they explore exhibits and activities geared toward discovery and outdoor fun. Even before spring has sprung, Donald Duck and his topiary pals set up camp in full floral color to celebrate the Great Outdoors at the Epcot front entrance. The elaborate topiary with a North American theme, live waterfall and pond features Goofy in a fly-fishing misadventure, Daisy Duck roasting marshmallows over a campfire and Pluto in his “pup tent.” It’s a must-stop photo op for guests as soon as they pass through the park turnstiles. Up to 700 butterflies flutter into an expanded and relocated, futuristic-themed Bambi’s Butterfly House – double the size of previous years’ Minnie’s Magnificent Butterfly Garden. The new butterfly abode in Future World West, at 3,500 square feet, allows hundreds of the winged beauties to flit among the lush foliage of a larger screened enclosure, where guests can wander and watch as multiple butterfly species light on flowers filled with nectar and as caterpillars emerge from their chrysalis in a special discovery exhibit. Bambi joins butterfly floral topiaries to welcome guests to the enclosure. · New Victory Garden – Disney’s “fab five” topiary pals – Mickey, Minnie, Donald, Pluto and Goofy – gather at American Adventure to tend tomatoes, beans, peppers, herbs and other edibles in their first Victory Garden as a salute to the history of World War II gardens, the new White House vegetable garden and the many community gardens being planted across the country. · Newly Expanded Pixie Hollow Fairy Garden – Colorful topiaries of Tinker Bell and friends from Walt Disney Pictures’ latest DVD release “Tinker Bell and the Lost Treasure” will sprinkle pixie dust over this playful, expanded garden for kids. New characters on display with returning fairy favorites are fast-flying, sharp-tongued Vidia and charming Terence, dispenser of pixie dust. Tinker Bell’s Nook has hands-on activities. In a synergistic turn, the “Lost Treasure” DVD includes a bonus feature on “The Making of the Fairy Garden,” featuring Disney cast members who designed and built Pixie Hollow, along with the movie’s producer and director, who helped plan the garden. 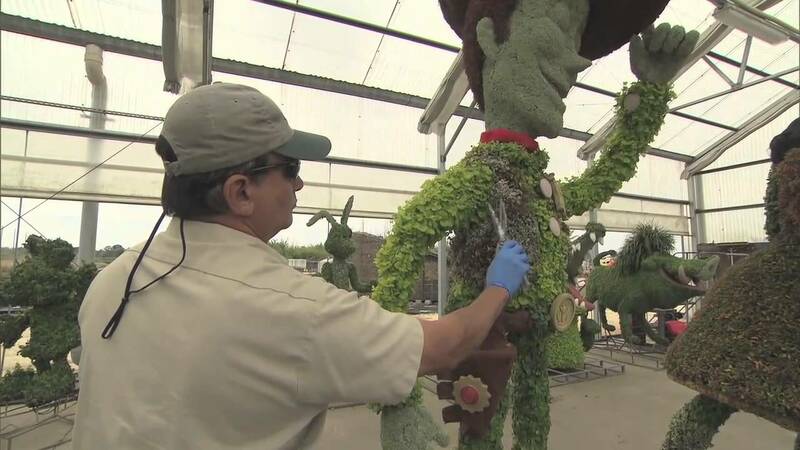 · First-Ever American Gothic Mickey Mouse and Minnie Mouse – Topiary experts pull out all the stops to create an American Gothic Mickey and Minnie topiary scene based on the 1930 Grant Wood painting. At World Showcase Plaza. · Pirates Adventure Zone – Peter Pan, Captain Hook and Croc topiaries will lure young swashbucklers to this interactive space designed for exploration and adventure. Next to the Germany pavilion. Throughout the festival, more than 70 topiaries plus sweeping floral beds and exhibits will decorate the park landscape and showcase the extraordinary craftsmanship of Disney gardeners. A Fragrance Garden at the France pavilion will tell the “love story” of plants and perfume, and the art of bonsai will “wow” guests at the Japan showcase. ·Flower Power concerts – Popular bands will rock the open-air America Gardens Theatre every Friday, Saturday and Sunday at 5:15, 6:30 and 7:45 p.m. Jose Feliciano is scheduled to kick off the concert series March 5-7. On subsequent weekends, the lineup is slated to feature pop favorites like Davy Jones, Chubby Checker & The Wildcats, Tony Orlando, former Boston lead singer Fran Cosmo, and other top acts. · Disney Gardening at Home presentations – Disney horticulturists will share gardening tips and lead guests in a hands-on, take-home activity. · The Great American Gardeners series – Gardening celebrities and authors from across the country will reveal their gardening secrets. Opening weekend, Robert Bowden, author and director of lush Harry P. Leu Gardens in Orlando, kicks off the series. · The Garden Town Festival Center – Guests can shop for festival merchandise, attend speaker presentations and demonstrations and ask gardening questions of the experts. · Special Festival Celebrations – An Art in the Garden celebration of plein air artists is scheduled March 26-28; a Florida Farmer’s Market celebration is April 23-25, and the popular I Dig Bugs event is set for April 30-May 2. More information about the 17th annual Epcot International Flower & Garden Festival is available by calling 407/W-DISNEY (934-7639) or by visiting disneyworld.com/flower. The festival, including all gardening programs and exhibits, is included in regular Epcot admission.